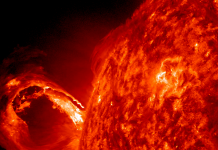 Magnetic fields erupted on Sept. 28th out of the Sun. The Solar and Heliospheric Observatory (SOHO) recorded the cloud as it raced away from the sun faster than 2.2 million mph. 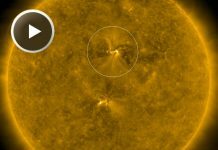 NOAA forecasters estimate a 50% chance of strong geomagnetic storms around the poles on Sept 30th when the cloud reaches Earth. 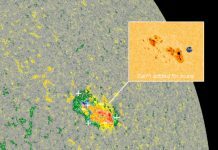 High-latitude sky watchers should be alert for auroras, which might be intense enough to see in spite of the full moonlight.